Touchdown Ducks. Hardrick 51 yard blocked FG return. Two point conversion failed. That was a strange play on the two point converstion. Addison is too good of a receiver to step out of boungs like that. Oregon recovers the onside kick. Oregon called for unsportsmanlike conduct. It will be Oregon's ball at the Oregon's 43 yard line. Stanford has played about 52 minutes of perfect football. Right now they are getting sloppy. Mariota has butterfingers tonight. Got lucky on his last two runs. Touchdown Ducks. Mariota 13 yard pass to Brown. Wogan adds the PAT. I can't believe this. This game was over. Stanford's defense is not stepping up when they need to. Stanford recovers the onside kick. It seems like sometimes they get too comfortable when they have a lead. That is going to do it for tonight. Stanford holds off Oregon's late rally. rector 1 reception, 47 yards. Time of possession: Oregon 17:26, Stanford 42:34. Some how, some way, I feel Stanford won this game for Kasey. Congratulations Stanford! I feel exactly the same way! This will make her happy and that's what matters most to me. 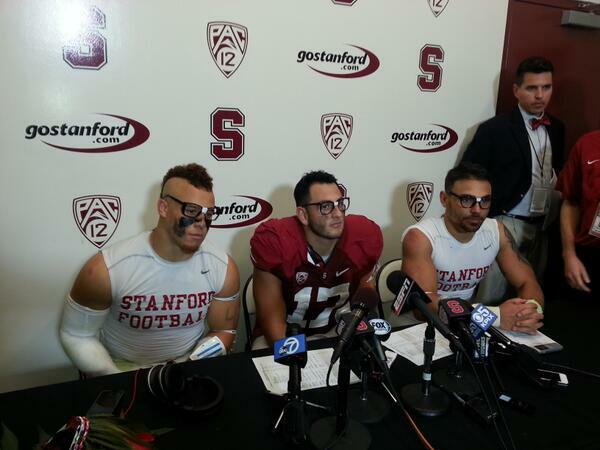 Stanford players proudly honoring Nerd Nation.